DMX Condoms, Cigs & Henney, Please ... My Hotel Room's So 'Hood! 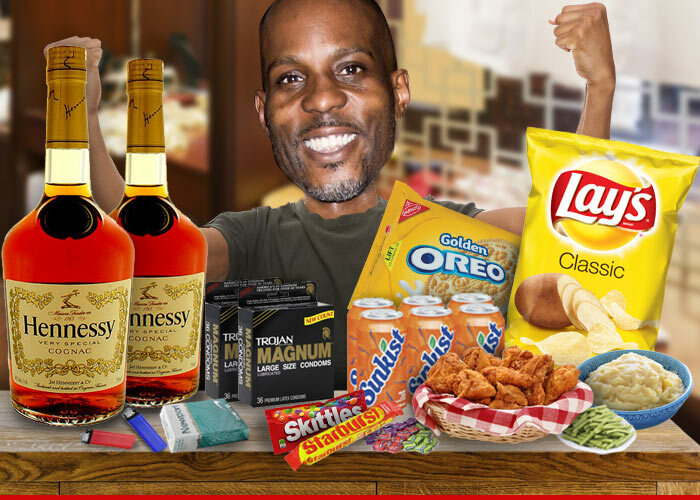 DMX -- Condoms, Cigs & Henney, Please ... My Hotel Room Is So 'Hood! DMX and The LOX might blow the roof off their downtown L.A. concert Wednesday -- but the real party's back at X's hotel room ... which is gonna be loaded with XL-sized condoms and Newports. DMX also requires $150 cash for "incidentals" -- what that means exactly ... we'll leave to your imagination. As for his dressing room ... it's a diabetic nightmare: TWO more fifths of Henney, hot chicken (white meat only), mashed potatoes, green beans, tons of soda, Oreos, Starbursts, Skittles, and yes -- more Now & Laters. Interesting though -- no condoms needed in the dressing room. We're told ... that is NOT where X is gonna give it to ya. Kandi Burruss' Tour Demands -- Don't Even Think of KFC ... I WANT POPEYES!